I’m happy to have Karen Young of HRResolutions.com on the show. She’s a purposeful HR person who believes in creating drama-free workplaces through purposeful communications and a “Yes, and…” approach. Karen’s a big proponent of the idea of “hire slow, fire fast.” She recommends taking your time in finding the right person for the job. To aid her company in hiring, she’s instituted a revolutionary new practice: the first step of the application process is for applicants to respond with their understanding of her company’s core values and what they mean to the applicant. This allows her to get the right people on the bus. As long as your bus is full of valuable people, you can fit them where they need to be in the organization and teach them the skills they need along the way. With the whole hiring and firing process, Karen says that most employers don’t know that as soon as they hire their first employee, they’re now responsible for at least 12 different employee regulations. From unemployment exposure to age discrimination to disability issues, employers need to do some research before they make their hiring and firing decisions. Explore your options and don’t be accidental in your choices. Making well-informed decisions can save you lots of headaches down the road. Regarding the idea of firing fast, “If you’ve made the decision to fire, you are not doing anyone any favors by dragging that out.” Don’t use excuses and don’t talk around it. Make your conversation short, sweet and honest and practice ahead to make it easier. Karen recommends keeping in mind that even though you have to fire someone (or just not hire them in the first place), they can still be a valuable referral resource for you in the future. Handling the situation correctly with compassion and dignity is the smart thing to do as you never know what the future can bring and how a relationship can re-develop at some point. I had a really great talk with Karen today and I truly appreciate her taking the time to share herself and her wealth of HR knowledge with us. Peter: Hey. Welcome back to Improv Is No Joke. This his Pete Margaritis, and I’m happy today to have as my guest Karen Young. She is an author of a best-selling book Stop Knocking on my Door: Drama Free HR to Help Grow Your Business. I’m sorry, every time I hear that “drama free” piece, I always kind of laugh because drama free HR, in my mind to some degree, could be like an oxymoron within the workplace. But I absolutely love her book. The review that I gave it is, “A must read for all entrepreneurs because Karen states, ‘no resource is more important than the people who work for you.’ She explores all areas of human resource management and gives you helpful hints and where to look for the landmines.” One of my favorites is, “Hire slow, fire fast, step carefully, and act decisively.” Great advice. Thanks for sharing such an insightful book to help create a drama free workplace. Please welcome Karen Young. Karen: Hi Pete. Thank you so much for having me. I really appreciate it. And yes there is such a thing as drama free HR. Peter: Karen, first thank you very much for taking time out of your busy schedule. I greatly appreciate you being a guest on my show. And I’m so looking forward to hearing the insightful words that you have to give to my audience on how they can create a drama free workplace. But first, Karen tell us a little bit about yourself. Karen: Sure. I am not an accidental HR person. I am an intentional HR person. But I do work with the accidental HR person who oftentimes is the account or the finance person who has ended up within HR because they handle all the other confidential stuff, so they might as well handle HR as well. Discovered in college that this is what I wanted to do and, much like you, I was a headhunter for a period of time and then got into payroll. So I get the numbers part of it. Probably the most difficult transition for me professionally was going from payroll to HR because payroll is very black and white. HR is anything but black and white. It’s all the gray areas. And you know, I really enjoyed your book. Peter: Thank you. Karen: I did not realize how much of what we do really is improv. 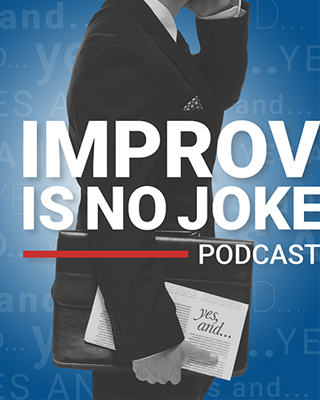 And when I first read Improv is No Joke, I’m thinking to myself, it doesn’t sound good for an HR person to be publicly telling people that everything we do is improv. But when it comes right down to it, it is because our job in HR is to say yes, and. But most HR people say, “No. We can’t do that.” And that’s where you get the drama—when you have people saying no. So, you and I need to work together on getting this message out. The answer is yes, and. Peter: Thank you for the reference to the book, and you’re right. Yes, and is the way to go. It’s motivating. It’s inspiring. It keeps conversations going. But the one thing that people think of when I talk about yes, and, I have to steer them down a different path. We’re not saying yes to everything. Karen: Absolutely. And that ties in so well to creating a drama free HR environment because I have found in my experience that most people, including employees, want to do the right thing. But where we fail is when we don’t listen to them. We don’t take their ideas into consideration. We say yes, but instead of yes, and, or having what I call a courageous conversation and saying we really can’t do that right now because. We have to take it a little further and explain to them the why. And generally they may not like it, but they’ll have a better understanding of why it might have to be no right now. Peter: Courageous conversations. I think it’s hard for a lot of people. Peter: And it’s hard for some in the accounting profession. What would be one tip that you could give my audience on how to approach those courageous conversations? Karen: Practice, in all honesty, as weird as that sounds. Write your talking points down, practice with someone, become comfortable in what you have to say. Don’t beat around the bush. The sooner you have the conversation, the easier it will be. And that even ties back into what you said about hire slow and fire fast. If you’ve made the decision to fire, you are not doing anyone any favors by dragging that out or by coming up with a million reasons why, “I’m so sorry Pete. We’re eliminating your position and it really has got nothing to do with you. And I know we’ve had a few performance conversations along the way but really this has nothing to do with you. It’s all about the business and we’re restructuring.” We talk around it. And we say we’re going to lay somebody off knowing that we’re going to be hiring to fill the position next week. Be honest and just be short and sweet. Be honest. And quite frankly, do practice because it makes that courageous conversation a little bit easier when you know ahead of time about what you’re going to say. Peter: Wow. I just had a number of flashbacks. I had a flashback to the time that I was a laid off at Victoria’s Secret Catalogue—not as a model. Karen. Darn it. Oops. HR inappropriate. Peter: When they eliminated my department, I just sort of relived that. Peter: That’s OK. And back to your book, you’ve laid out a wonderful roadmap for any entrepreneur to pick up your book and put the systems and processes and procedures in place in order to—from an accounting perspective—to be compliant. Because you talk about a ton of the compliance issues that we all must be aware of even when we hire one employee. Karen: I know. That still boggles my mind—even when we look at one employee. The most entertaining one to me is that as soon as you hire one employee, you’re responsible for the Equal Pay Act. So, be sure that you pay that one person the same thing that you would pay that one person. Be sure you pay them equally to themselves. However, with only one employee you are responsible for the Equal Pay Act. There is actually almost a dozen employment regulations that you’re responsible for with only one employee and depending upon the state that you’re in, it may be even more. For example, in Arizona you cannot discriminate as soon as you hire one employee. You have to have nondiscrimination policies in place for just one employee. Peter: Wow. Karen: So, each state is different. But from a federal standpoint, you’re looking at a dozen employment regulations. Who knows that stuff? I didn’t even know that stuff until I started my own business. And that’s how I found out. I had been in big business and in big business, once you’re over fifty employees, you are responsible for all the regulations. You’re playing with the big boys over fifty. But still, that group, from the one to fifty employees, there are employment regulations that are out there that you’re probably not going to be aware of. And one part of drama free HR is being aware of your risk and making an informed business decision. You make a risky decision, but that’s OK if it’s informed. And you know what your risk is. That reduces your drama. If you say, “I’m going to fire this person today,” without the documentation in place. OK. It’s a business decision. But just be ready for what the implications of that might be. Be ready for the yes, and if I do this. Peter: And some of those implications could be? Peter: And when you’re talking about employment and letting someone go because they’re not a right fit, I think a question that the business owner should ask, “Are they not a right fit in my organization or are they not a right fit in the specific job? Karen: The question I’m finding with many of my small employers is, “Do we even know what our own culture is?” So, that adds some drama; that adds some challenge. We don’t even know what our own culture is. The best thing I did for my organization, a couple years ago, was develop a solid vision, mission, and values statement so that everybody—we’re all working toward the same goal. Everyone here knows what the vision is. They know what the mission is. We all work around our core values. I actually changed our recruiting last year. Instead of a traditional job application, applicants need to reply to us with their understanding of our core values and what our core values mean to them. Peter: Wow. That’s wonderful. Karen: What a difference that made. And I’ll tell you what, from a traditional HR person, the hair on the back of my neck went up. And I’m like, “I’m stepping outside of the box. Oh, no. You’re supposed to have an applicant fill out an application. Oh, no.” We do still get the application completed but only by those that are moving forward in the interview process. The first application with us is, “Tell me about what our core values mean to you.” Because I can teach somebody how to do a handbook review. I can say, “These are the things you look for. Here’s the checklist.” I can’t teach someone that HR is fun. They get it or they don’t get it. It is fun for them or it isn’t. If it’s not fun for them they will lose their mind working in this organization. Peter: Because you’re dealing with people every single day. But I even ask my audiences what business are they in, and they’ll go, “I’m in accounting services. I’m a consultant.” And I go, “No, no, no, no, no. You’re in the people business first and foremost.” And you address this really well in your book because without people you have no employees. Without people you have no clients, customers, whatever. So, I always remind audiences that we are in the people business. We need to go into that area that we might not be as comfortable with but need to get very comfortable with. And I absolutely love your new interviewing process that you put in place by having them basically tell you how they fit into the mission, the vision, the core values of the organization before you move on to the next step. Because just in that instance, you know that one, they’ve done their homework. They’re coming prepared. And you can get a sense right off the bat if they’re either gonna be a great fit, or they’re not gonna fit at all. And then you’ve got the gray area. Karen: Right. Peter: What result have you seen from that? Peter: How large is your organization? Peter: Wow. That’s great. And I’m still wowed by the whole concept of first in the interview process of getting them to talk but the mission, vision, and core values. And I would think that it doesn’t matter the size of the organization. Karen: Not at all. Not at all. Peter: Those of you listening to this in my audience, think about your hiring practices and take in this wonderful advice. I knew there were gonna be a lot of great nuggets but this is a little boulder. Karen: Thank you. The critical thing is, they need to know what their core values are. Karen: And we started this with our core values for the organization. Now within each job there are also going to be values and competencies that the individual must possess. For example, our HR Coordinator must be very detail oriented. Our HR Manager not so much. Our HR Manager’s working more in the gray area, so there are those individual fit pieces within the job as well. And we need to pay attention to those to because you may have an individual that isn’t a fit in their job, but they are in the overall organization. And if you can find a way, get them in. And I never remember authors so I shouldn’t be giving citations…Scott Collins. Another cliché, but get the right people in the right seats on the right bus. So, if they’re not a fit in one job that doesn’t mean that you throw the baby out with the bathwater. Karen: All these clichés. Its HR. We have acronyms for everything and we use clichés to demonstrate our point. But you may be able to find a way in which they can really click within the organization but just not in that job. Peter: Great point. And I think that a lot of times, maybe we are thinking too much inside the box to say to this individual, who’s not fitting into that job, that maybe they possess some quality or skillset. Maybe we create a new job for this person if we see that they fit within our organization. They can bring value. They’re just not in the right role. Karen: Absolutely. And the other side of that Pete, one of the most difficult is when the position outgrows the person, and when the person has been a key contributor for the growth of the organization but the organization and the position has grown beyond them. That’s one of the most difficult scenarios. Peter: What do you do? Karen: You need to make an adjustment. Karen: Yes. That’s my nice way of saying you need to help them exit from the organization. That’s one of the most painful ones too. Peter: I believe so because they’ve been a good performer. But they have outgrown the role and there’s no place for them. But that also turns into an opportunity because if the exit is handled in such a way, you have a viable resource out there that could be a wonderful referral service to your organization. I’m a big believer we all will be moving in and out of jobs. And if we can have the exit process in a very professional way, that we take emotion and all the other pieces out, that person who’s moving on can be a wonderful resource to the organization—as long as everybody’s left on good terms and you create a referral system from that. Karen: Correct. And not only referral for future employees but a referral for future business. A referral for future introductions that might lead to future business. The same with your candidates that aren’t a fit for the exact position that you have right now. And I do mention this in the book. You want to reject your candidates in a very positive way because who knows down the road. And recruiting is challenging enough as it is. If you find a person that’s not a fit for job position A today, but three or four months down the road you have job position B, what better resource do you have then to go back to, “My gosh you weren’t a fit for this HR Manager position, but we have an HR Coordinator position open now. I think you could be ideal for that. Are you still in the market?” I’ve saved all my recruiting costs. I’m not re-recruiting. Because I kept a positive relationship with that individual, they might say, “You know, no. I’m not looking anymore. But my friend Susie is. I understand she is pretty much like me. May I make an introduction?” Again, I’ve saved on my recruiting cost because I maintained a positive relationship with that individual. I left them with a positive feeling about my organization. 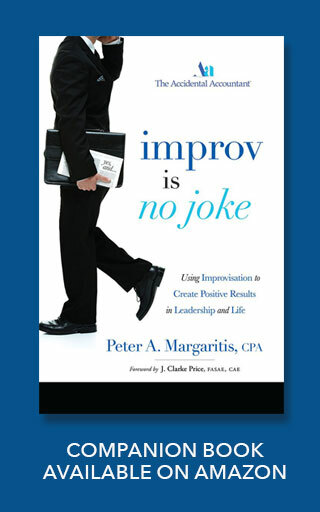 Peter: So, to put it in terms of Improv, you’ve had an exit process or you did not bring them on board. But during the whole piece you yes, and-ed them to the point that when the decision was made that they weren’t right for the role, there was no animosity. Peter: Thank you for that, that helps wonderfully. In respect of your time, I don’t want to take up too much because I know how busy you are. What’s the one thing that you would like to tell my audience that you haven’t already spoken about already that they would find to be very beneficial in the work environment? Karen: Great question. And I’m going to go back to what you had mentioned earlier about the book. When I’m speaking with HR professionals, go back to the basics. Set up the basics of an HR department no matter the size of your company. Stick with the basics. They are solid. They’re tried, they’re true. Stick with the basics and that is going to reduce your drama with your HR. Peter: Wow. Thank you so very much Karen. I’m so blown away by this conversation that I’m looking forward to when it is aired. And the response my audience will have too because you provided so much value in such a short bit of time. So, once again, thank you for taking time. I greatly appreciate it and I know that you will be back on this podcast, maybe a year later and we will explore other areas of drama free HR. So, thank you Karen.